U17 A Championship v Belnaleck in Tempo Wed 645pm throw in. all support appreciated! A quiet weekend for the club, the senior side now awaiting a firm date for their relegation fixture with Lisnaskea, this presumably not taking place until after the county championship final. Defeat in this clash with Emmetts would mean relegation to next season’s second division, a win and the side would then have a final make or break tie with the loser of the Irvinestown v Erne Gaels tie. 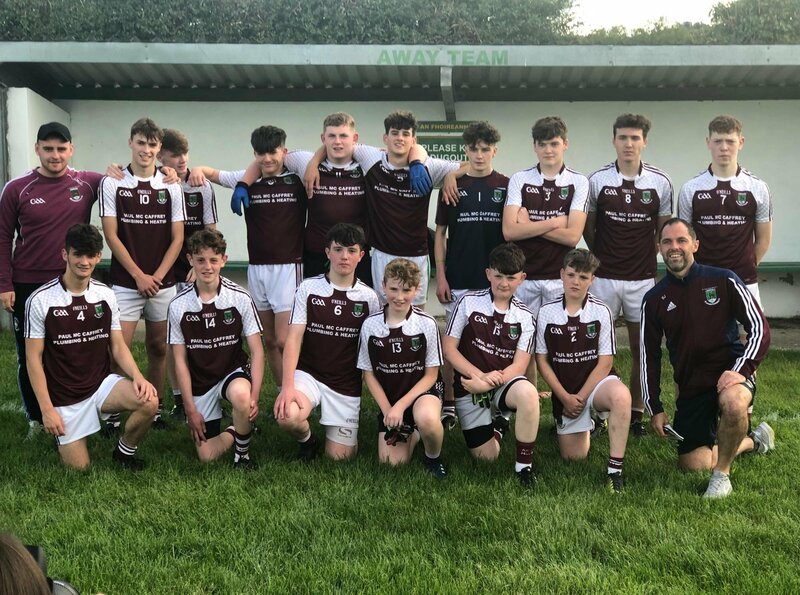 The under 17 side have a championship quarter final this evening Wednesday against Belnaleck, at the time of writing no details in regard to venue, throw in time is not available. Given the fact that the team has been performing well in the second division of the league and has reached that divisional final, there are grounds for hope that a strong challenge can be mounted in the championship. 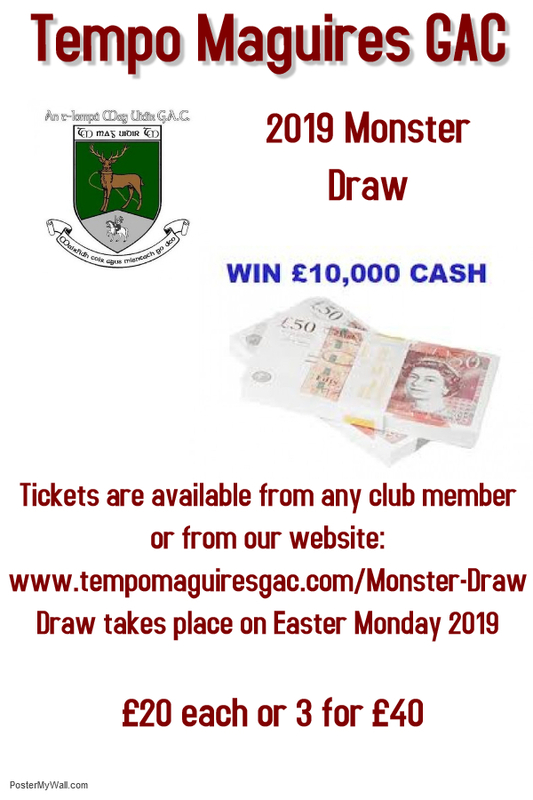 Lotto jackpot for last weekend was not won, the numbers drawn being 1 14 22 and 27.Winners of the two £25 prizes were Donna McMahon and James Breen. Jackpot for next weekend now stands at £3 200. Team on duty for Saturday September 22nd is Shane Breen, Marius Kerr and Conor Meehan. Team on duty for Saturdays September 29th and October 6th is Damian Kelly, Ryan Bogue, Niall Breen and Leonard Kelly. Games session in the Community Centre continues each Thursday night, opening game at 9-00 and top prize on offer is £5 000 on game ten. Admission is £10. The week past began on a positive note with the under 17 side chalking up a five points home victory over Teemore and the league points earned assures them of a place in the second division league decider, the opponents here in all probability being Lisnaskea. Against Teemore the critical score came just prior to the interval, a goal poked home from close range by Conor Magee and while Teemore put in a very resolute second half effort to recover lost ground, some stout hearted Tempo defensive work held the Shamrocks at bay. A few more league fixtures to be played before the final itself though there would be the possibility that given the fact that the both the league finalists have been decided, those games may fall by the wayside. 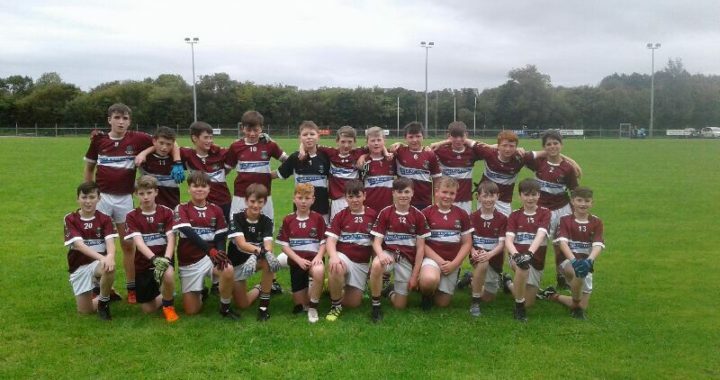 Senior championship football for next season was secured when the team scored a three point victory over Teemore in the relegation semi final played at Derrygonnelly on Saturday afternoon. It was a patchy enough opening half performance however, Teemore enjoying the greater share of the attacking play so Tempo, only three points adrift on the turnover would have been happy enough in the circumstances. Much , much better from the side in the second half as they upped the intensity of their game and at one stage they had pushed out into a six point lead. There was to be an anxious run in over the closing minutes however as Teemore staged a spirited rally but the Maguires hung on for what was in the end a fully deserved success. Unhappily no joy for the ladies team as they lost their intermediate championship final at Lisnaskea to a more experienced Derrygonnelly side. From the outset the Harps looked to be the stronger squad and they made the pace from the start reaching the interval holding the lead and they were not to be overhauled. A goal in each half from Blaithín Bogue did keep the team in the hunt but in the end they were to be five points adrift. Among those who played exceptionally well were defenders Ciara Kennedy and Cliona Bogue and others to put in a solid effort were Roisin McCusker and Shannon McQuaid. Lotto jackpot for last weekend was not won the numbers drawn being 3 5 10 and 12. Winners of the two £25 prizes were Paddy Green and Nicola Maguire. 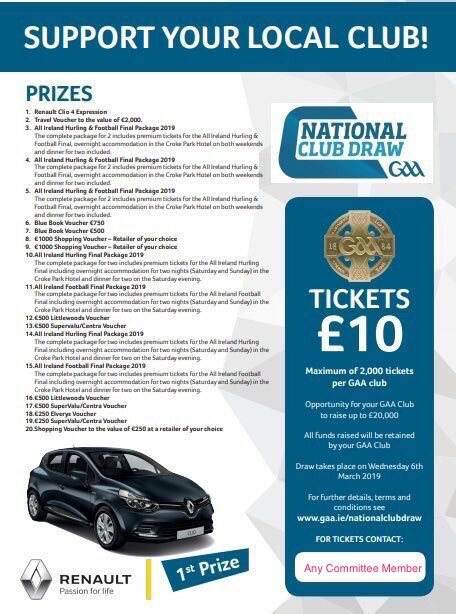 Jackpot for next weekend now stands at £3 100 and the team on duty for Saturdays September 15th and 22nd is Shane Breen, Marius Kerr and Conor Meehan. Team on duty for September 29th and October 6th is Damian Kelly, Ryan Bogue, Niall Breen and Leonard Kelly. Great team performance by the lads,well done all. U17 Div 2 league result Tempo 1.12 vs 1.7 Teemore. We have now qualified for Div 2 league Final vs Lisnaskea. Well done lads!